After what seemed like a lifetime of anticipation, Secrets Resorts & Spas have finally hit the golden beaches of Puerto Vallarta; we couldn’t be more excited…and the resort couldn’t be more beautiful! A weekend of exciting events, including an inauguration by Mexico’s President Felipe Calderón, marked the introduction of Secrets Vallarta Bay Puerto Vallarta into the Secrets family and the destination. This 271 all-suite, all ocean view vision welcomes adults-only to the gorgeous beaches of the Pacific coast. 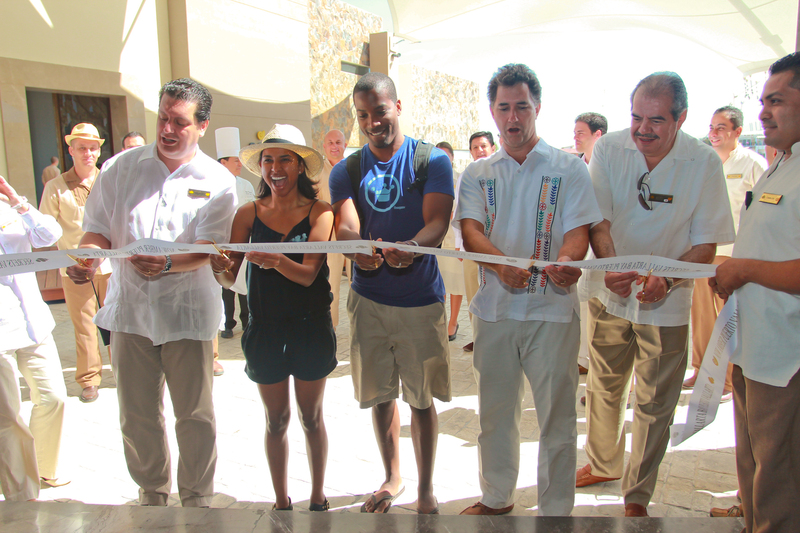 The entire Secrets Vallarta Bay staff took pride in welcoming our first guests, Tristan and Amoy Walker on April 1st, 2012. Mr. and Mrs. Walker pose with the Secrets Vallarta Bay staff as they are welcomed as the first guests! In store for the happy couple are Unlimited-Luxury® privileges like 24-hour concierge and room services, multiple gourmet, a la carte restaurants and lounges serving premium beverages as well as endless day and evening activities and access to our indulging Secrets Spa by Pevonia and fitness facilities. We look forward to welcoming many more guests in the future to the hottest resort to hit Puerto Vallarta! Take a look at more photos of Secrets Vallarta Bay. Are you a Facebook fan of our Secrets Resorts & Spas pages yet? If you aren’t, you should be! Liking our pages gives you access to the latest news, updates and promotions on our luxury resorts and now you can win big during an exclusive Facebook sweepstakes. 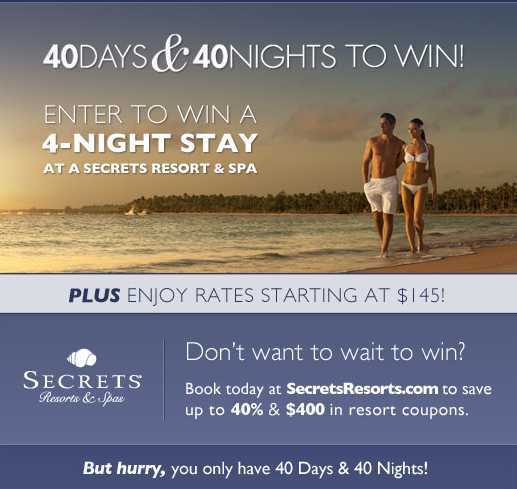 We’re giving away an Unlimited-Luxury® 4-night stay at a Secrets Resort & Spa during the 40 Days & 40 Nights Sweepstakes. All you have to do to win is click on the 40/40 tab on the left and then enter. But hurry because the 40 Days & 40 Nights Sweepstakes ends on March 3rd! Don’t want to wait to win? Then book now with rates starting at $145 per person! Plus receive up to $400 in resort coupons to be redeemed for spa treatments, romantic dinning and more. Book your trip now to save big! 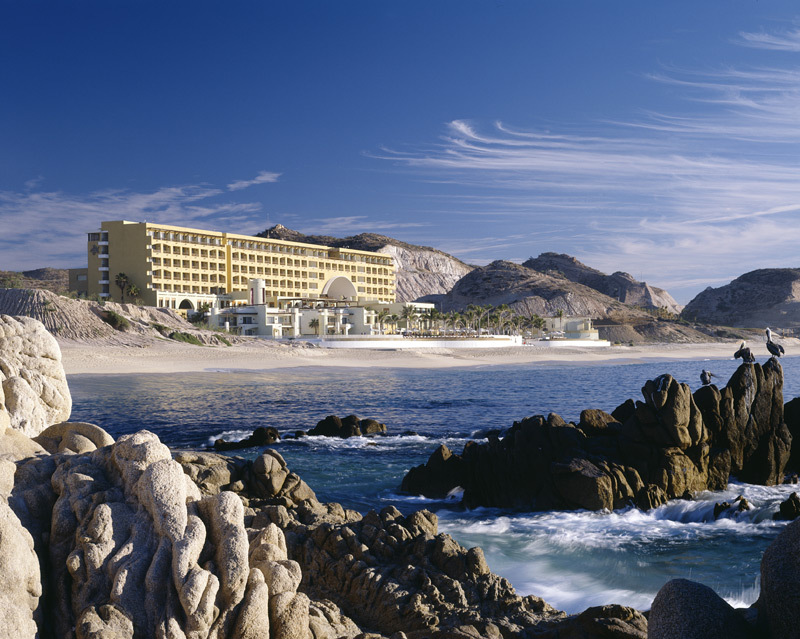 We’re excited to welcome Secrets Marquis Los Cabos as the newest resort to the Secrets Resorts & Spas family. Beginning November 1st, Secrets Marquis Los Cabos, a proud member of The Leading Hotels of the World, will bring adults-only Unlimited-Luxury® for the first time to Mexico’s Baja Peninsula. Situated on a land where the tranquil desert meets the untamed waters of the Pacific Ocean, guests will feel a sense of excitement and experience a world of pleasure. Located a mere 25 minutes from Los Cabos International Airport and close to Cabo’s most famed landmarks, El Arco, Land’s End and Lover’s Beach, this seaside escape sits serenely along the coastline with views of the pristine beach, magnificent Sea of Cortes and the tranquil desert. The property includes 235 rooms, ranging from spacious, private poolside casitas to luxurious ocean front suites, all featuring contemporary Mexican-inspired decor with distinctive oil-paintings, luxurious furnishings and imported linens. Each room is finely-appointed with exceptional amenities that include a balcony or terrace showcasing stunning views of the Sea of Cortes, daily refreshed mini bar, satellite television, luxury bath amenities, wireless internet access* and so much more. Guests can enjoy the privileges of Unlimited-Luxury® with gourmet dining options at the resort’s five distinctive restaurants, unlimited premium brand beverages at any of the three bars, 24-hour room service, pool and beach wait service, countless daytime activities, live evening performances and more. For those seeking relaxation, the resort boasts a 15,000 square-foot spa with a fully-equipped fitness center, steam room and hot tubs overlooking the breaking waves of the Sea of Cortes. To celebrate the opening, we’re offering a very special introductory rate of $249.00 per person, per night at Secrets Marquis. Rates are for travel from November 1 – June 22 and are based on double occupancy. Book now until October 15th and be among the first to experience adults-only Unlimited-Luxury® at Secrets Marquis Los Cabos. Click here to find out more about the property or join the conversation on Facebook by becoming a fan of the Secrets Marquis Los Cabos Facebook page today.